the semi-finals of the U-17 World Cup if Nigeria makes it that far. 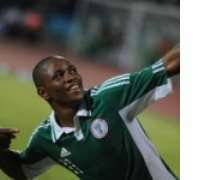 The forward limped out after Nigeria's second game of the tournament with a hamstring injury and has not featured since. But Coach Manu Garba says the striker is making good progress and is in line for a return. 'Success is making good progress and he could be among the selection for the semi-final if we qualify,' Manu told SportingLife. 'He is a nice player with lots of enthusiasm for the game. 'I will be willing to play him if he is 75 percent fit. Nigeria faces Uruguay in Saturday's quarter-final. Kick-off is at 5pm Nigeria time.